A. The vSphere credentials have not been granted permissions. B. 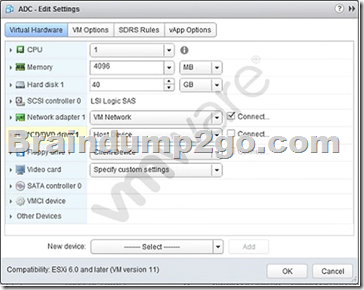 The vSphere credentials are granted read-only permissions. C. The vSphere credentials are granted no-access permissions. D. The vSphere credentials are not a member of the local administrator group. A. There is a network I/O constraint. B. There is a storage I/O constraint. C. There is insufficient disk space assigned to the virtual machine. D. The application is not virtualization aware. Refer to the Exhibit. An administrator is installing Windows into a virtual machine. The DVD has been mounted on the Host and configured for the virtual machine as shown in the Exhibit. A. The CD/DVD device is not connected. B. The ISO is in the incorrect storage location. C. The OS minimum requirements have not been met. D. The CD/DVD device is not set to Client Device. A. Use the datastore browser to locate the template, then right click and add the .vmtx file to inventory. B. Use the datastore browser to locate the template, then right click and add the .vmx file to inventory. C. Using the Managed Object Browser and adding the template from the ManagedObjectReference:GuestFileManager object. D. Using the Managed Object Browser and adding the template from the ManagedObjectReference:VirtualDiskManager object.